This Twino review is 100% unbiased and based on my own experiences after three years of investing. 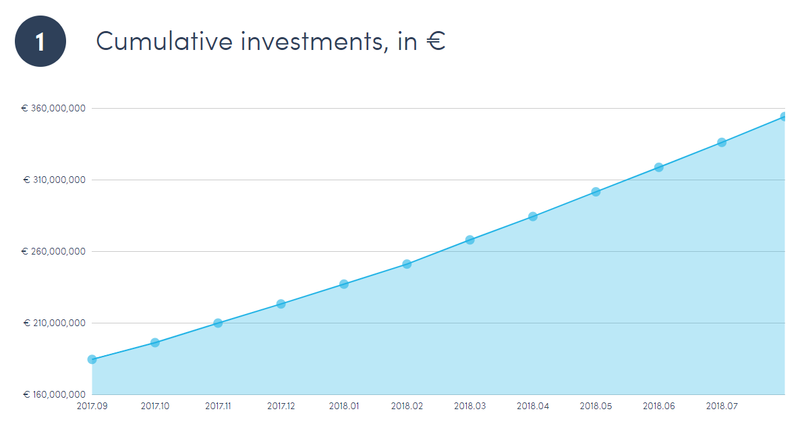 TWINO has played a crucial role in the rapid expansion of P2P lending in Continental Europe. At TWINO theye connect investors seeking premium returns with borrowers searching for convenient loans, through the digital landscape. Their disruptive platform has democratised an investment process that was previously only accessible to the prosperous few. They are now one of the most successful marketplace lenders in Continental Europe and are the first platform to introduce P2P lending to emerging markets such as Russia and Kazakhstan. 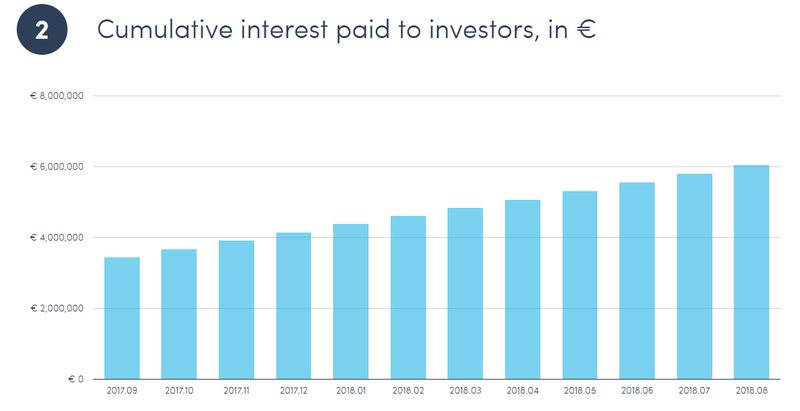 They are so successful in fact, that they issue roughly €1m in loans every single day, offering investors rates in excess of 10% per annum. In combination with the company’s strong management team, local presence and proprietary scoring models, the investment marketplace fuels the growth of the company in the existing markets, as well as its geographical expansion. They have made this possible by employing 400 talented people across 6 locations. Becoming a member is very straight forward. Firstly, pick if you want to make a private person or a company account and then fill out the required data in the form and your account is created. 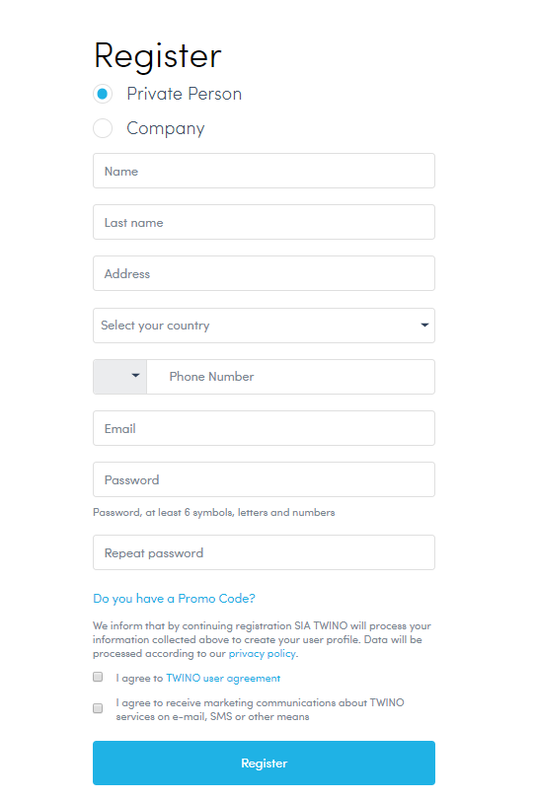 After registration, their systems will send you a confirmation email with a long PDF called “Twino regulations for the use of the website” of which 12 pages are in english. I recommend to you to read them through. They include the terminology and other important data. To add funds to you account you simply make a SEPA transfer through your bank. 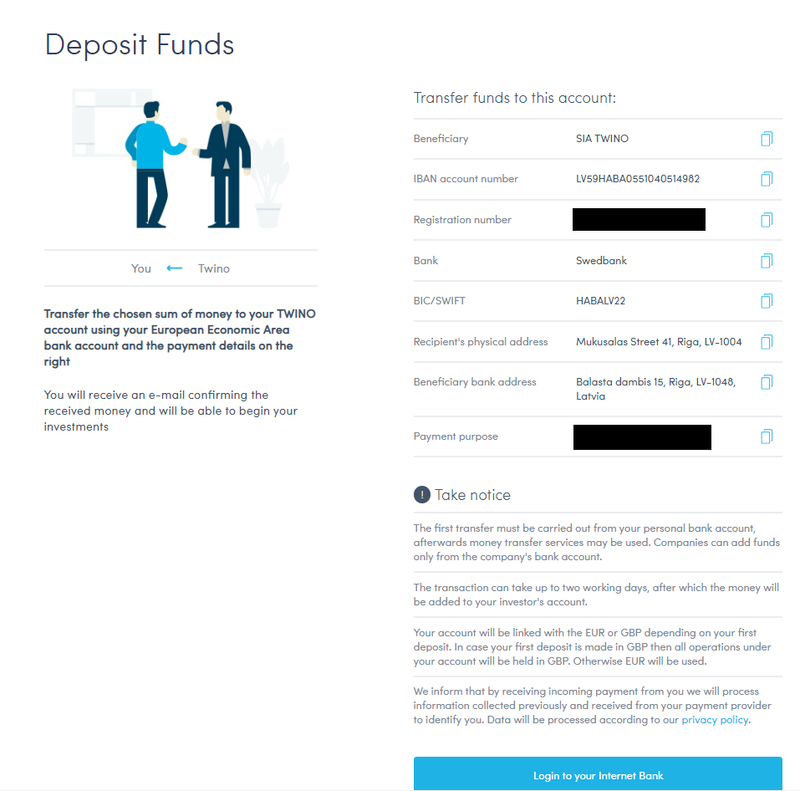 All the receiving bank account information is available under the “Add funds” page. Remember to include your personal reference number in the payment details. Twino’s site is easy to navigate and you can quickly find the information you need. There are 5 menus. 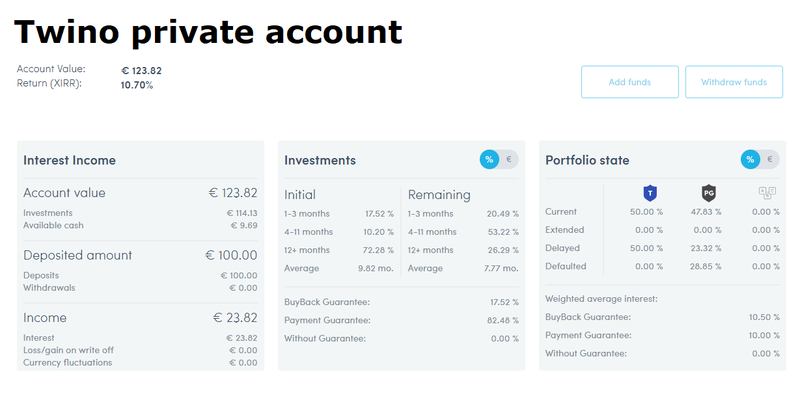 They’ve put a lot of work into creating an intuitive dashboard that makes it is incredibly simple to manage your funds, investments, and payouts, all from the same place. Clearly see your portfolio, account balance and opportunities and easily make new investments, withdrawals, and deposits. 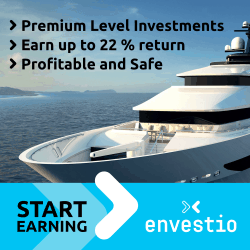 Auto Invest is the fastest way to invest your money, as well as to reinvest earned profit – you save time and can select your own criteria for all the transactions. Auto Invest tool will automatically integrate any investment strategy of your choice. After selecting your preferred investment criteria, it automatically invests corresponding sums of money accordingly. Auto Invest users can choose to invest manually at any time, stop using Auto Invest temporarily or completely cancel the application. 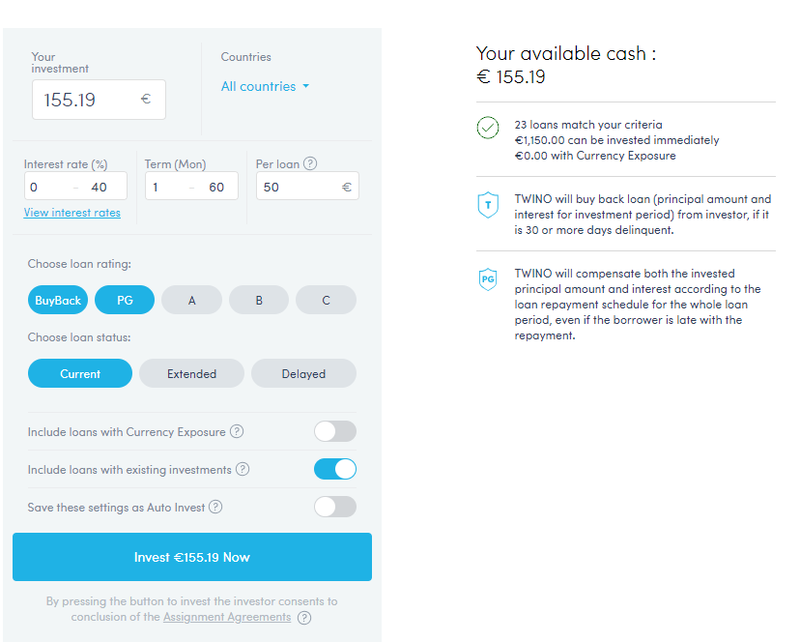 Explanation: If you have successfully added €1000 to your TWINO account and wish to invest this sum using Auto Invest tool, you should select your own criteria for this transaction. 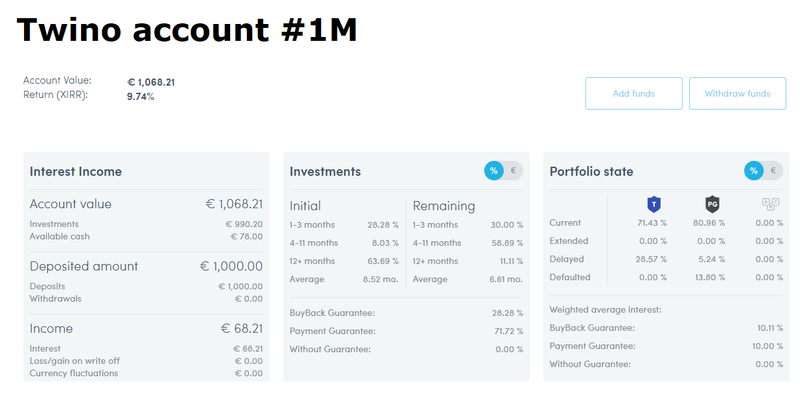 Set the investment sum to the amount you wish to invest using Auto Invest – in this case €1000. Then set the maximum amount you wish to invest in a single loan – in this case €50. And set an interest rate for any prospective loans, for example in the range of 10-15%. You can take your Twino account with you anywhere, on any device. Make sure you never miss a great investment opportunity with the ability to manage your dashboard on the go. It’s like having an investment portfolio in your pocket. How does TWINO protect OUR investment? TWINO provides two types of investor protection schemes – BuyBack Guarantee and Payment Guarantee. 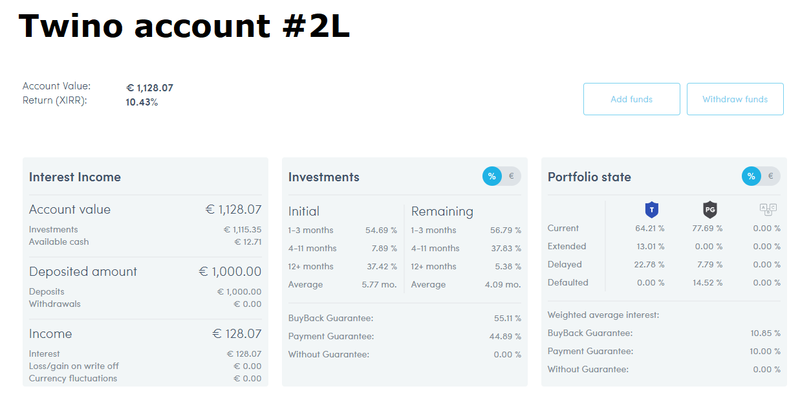 Under the BuyBack Guarantee investor protection scheme, TWINO will compensate the investors both the invested principal amount and interest, as well as pay the accrued interest in case a borrower is late with the repayment for over 30 days. Loans with the BuyBack Guarantee are denoted with the icon . 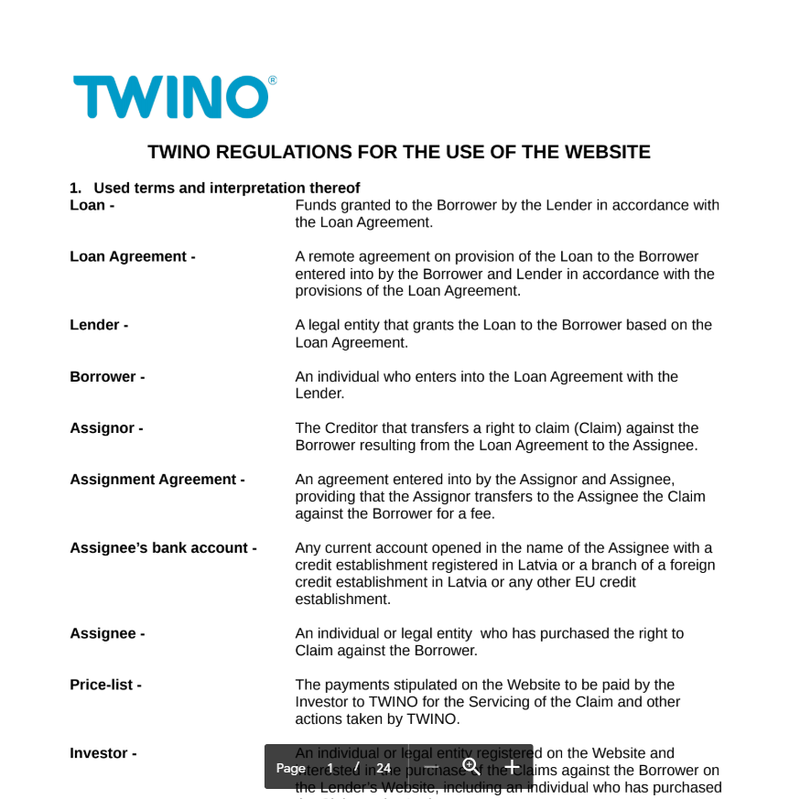 Under the Payment Guarantee investor protection scheme, TWINO will compensate both the invested principal amount and earned interest as per original loan repayment schedule, even if the borrower is late with the repayment. The Payment Guarantee applies to the whole duration of the loan. Loans with the Payment Guarantee are denoted with the icon . Loans with the Ratings A, B, C are not covered by the BuyBack or Payment Guarantee. 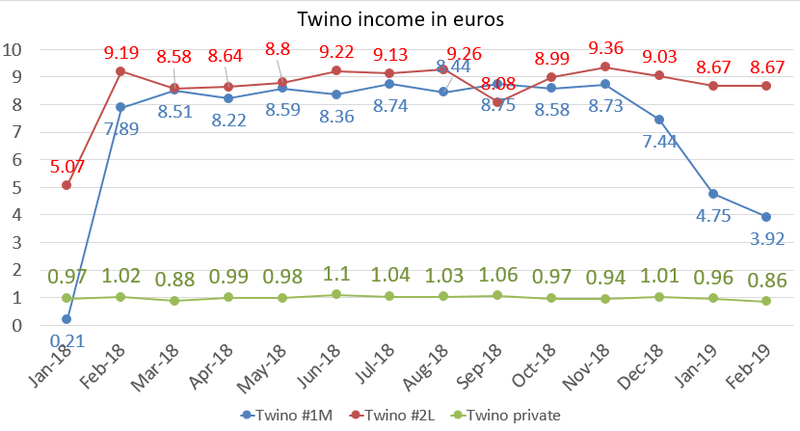 For background information, Twino is not fully transparent about the overall financial condition of the Twino Group and at the beginning of the year 2019, they released financial statement for the year 2015/2016. That’s crazy … Clearly something fishy is going on there. Also there’s a high percentage of loans which have defaulted and investors must depend on Twino’s buyback and payment guarantee systems. In addition the interest rates have been steadily falling and I’m more than confident that I can find better interest rates from different P2P platforms and still have buyback guarantee. Therefore, if I’d be a new investor at Twino platform after reading this review, I wouldn’t transfer my funds to this P2P lending site. I would rather take a closer look at platforms like Mintos, Envestio, Estateguru and Crowdestate. So where else to invest? For those looking for other similar or even better peer to peer platforms to invest, you may want to read some of my other reviews. There are many peer to peer lending and investing platforms currently available, and you can diversify your interest income by using several of them simultaneously, just like I do. You can consider some other peer to peer companies checking my Mintos review, Envestio review, Estateguru review and Crowdestate review. You can check my Twino portfolio by clicking here. Therefore are you considering Twino, but still have unanswered questions? Go ahead and post your questions or concerns below! 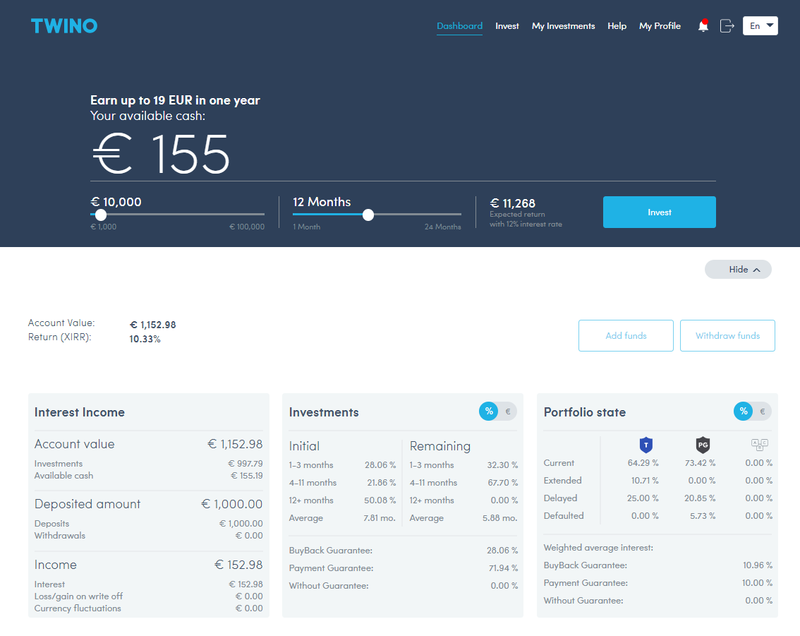 Or if you’re already a seasoned Twino investor, what are your thoughts about the platform? Are you satisfied with the investing experience?